Night time in our backyard is more than a happy chorus of frogs! We do suffer a great deal from suburban light pollution but looking up at the stars on a clear night is magical. This is one of my favourite pictures. It was taken by my husband, Allan. He had only just set up his brand new telescope and was taking pictures for the first time. Clear skies and mild weather made it a wonderful evening under the stars. The moon looked stunning and as I watched the eclipse taking place, a shooting star streaked across the sky. 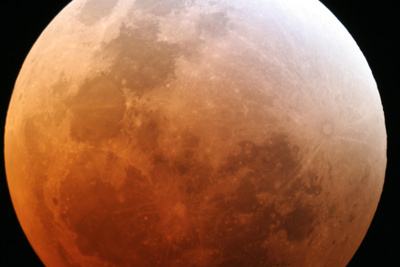 I believe the opportunity to see a lunar eclipse from beginning to end is something special. The next total lunar eclipse to equal this one will not be until 2011.